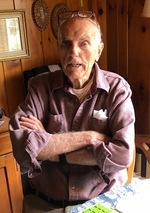 Eric A. Burton, beloved husband for 75 years of Mary Louise (Cayer) Burton, of Ashaway Road, Bradford, passed away at The Westerly Hospital on Sunday, November 18, 2018 at the age of 97. Born in Long Eaton, England, he was the son of the late Arthur C. and Annie Burton. After high school, Eric worked as a weaver for Richmond Lace Works in Alton until he entered the US Army where he served for more than five years during WWII. He then worked in security at Electric Boat for 21 years. Eric was a communicant of Our Lady of Victory Church and was also president of the Surfside 8 Dancers. Besides his wife Mary Louise, he leaves two children, Bruce A. Burton of Mystic, CT and Brian J. Burton of Coventry, RI; seven grandchildren; and eleven great grandchildren. Mr. Burton was predeceased by his son Steven, killed in Vietnam; and brother Raymond Burton.